Do you need to extract data from an old 2.5" Sata or SSD drive but can't? Well here is the tool for the job. Simply plug you old drive into this cable, and then the USB end into your PC, Laptop or Mac. You can then simply drag and drop the data from this drive to your PC, Laptop or Mac. It's very easy - and an ideal alternative to our All in 1 HDD docking station. This will only work on 2.5" Laptop drives however as your USB ports cannot supply enough power to run a 3.5" desktop hard drive. Our All in 1 HDD docking station however, will support multiple drives. No drivers are required if your machine uses one of the OS's listed below.. 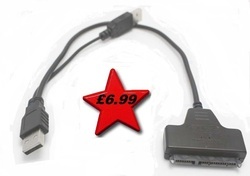 Some desktop PC's may need to be using the rear USB port, as the Front USB's may run at a slightly lower current.